Our delightful and spacious self catering holiday homes in Carrick on Shannon (4 available to choose from), including a new, apartment style, 2 bed roomed house are set in the fabulous surroundings of Ireland’s most beautiful inland waterway town, Carrick-on-Shannon, County Leitrim. In your home away from home, luxury and comfort can be enjoyed in a relaxed setting. No need to drive or get taxis:- we’re right in the town close to the town centre so you can enjoy the convenience of its many pubs, restaurants and scores of leisure activities (e.g. golf, walking, sight-seeking, fishing, boating, horse-riding). 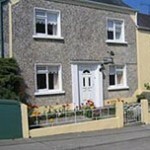 Our holiday homes in Leitrim are tastefully decorated throughout with the accent on high quality furnishings. Each home is thoughtfully and individually furnished for your comfort. Don’t take our word for it on being a great place to stay. Read what some of our other guests have to say about us in the Guest Book. Located in a secure, quiet location our self-catering or vacation rentals are ideally suited to families or to people just wanting to ‘get away from it all’. You can enjoy stroll through the town, a trip down the river Shannon or a walk through the nearby Forest Park.